Moving along to Page 99 of the 1929's The New Human Interest Library, here's a full-page illustration — from the chapter with the sexist title "Things For Boys To Make" — focusing on many knots that I cannot possibly make, even though I did make it all the way through Webelos and up to the Boy Scout rank of Tenderfoot. Supposedly handy knots shown here include the Carrick Bend, Fisherman's Knot, Killick Hitch, Timber Hitch, Magnus Hitch and Running Knot. And, yes, Magnus Hitch would be a good name for a Bond villain. Loved seeing the many different knots from the chapter entitled - "Things for Boys to Make". It brought back many memories from my Boy Scout days. I remember so many of the knots but we remembered them by other names. 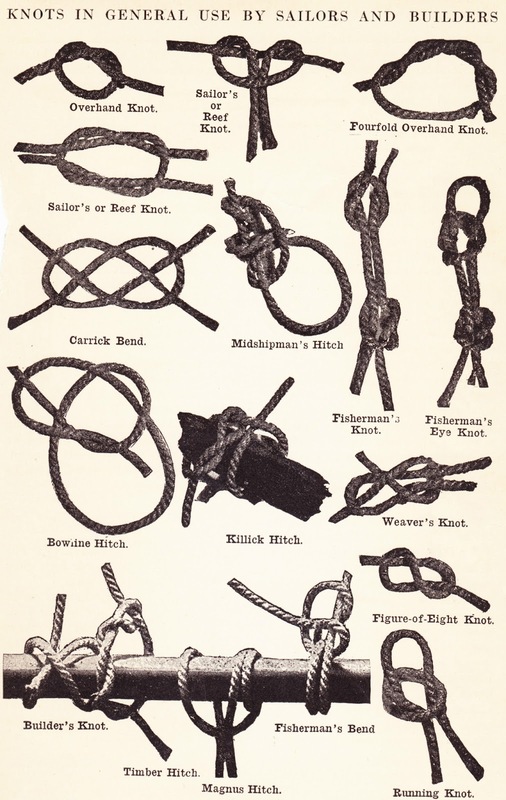 For example the "Sailor's or Beef Knot" was known as the "Square Knot" when I was in Boy Scouts. One year while being a Boy Scout Lifeguard at Camp Tuckahoe we learned a new knot. I forget the name of that knot now but we used it to tie the lifeguard rescue boat to the wharf. It was a type of slip knot. In an emergency all you had to do was yank on the end and the boat would immediately come loose. The neat thing about the knot was that no matter how forceful the moored boat would pull against the knot when it was tied to the wharf, it would not come loose. I don't think I know how to tie that knot anymore. Loved seeing the various knots from this book.